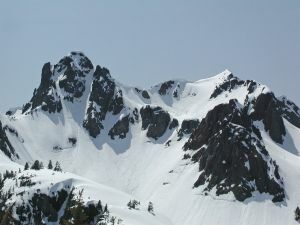 Brunswick Mountain, located north of The Lions and Mount Harvey, is the highest peak in the North Shore-Howe Sound area. The Howe Sound Crest Trail cuts across its western flank and a rough, steep side trail leads to the summit ridge. Name Notes: Named c1859 by Captain Richards, in association with other Howe Sound names, after HMS Brunswick, 74 guns, 1,836 tons, under Captain John Harvey. Built at Deptford, and launched in 1790.